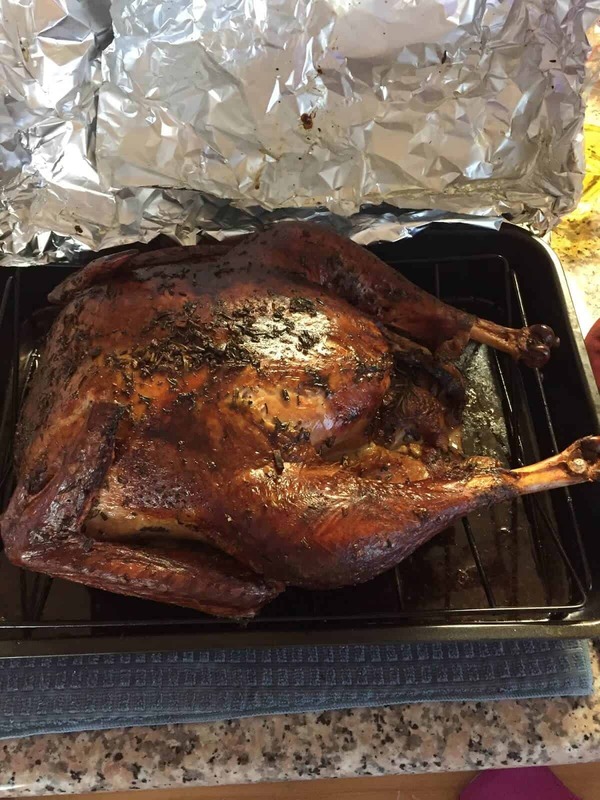 Cooking Thanksgiving dinner with a remote digital food thermometer is a game-changer. The holiday is stressful enough without worrying about overcooking—or, worse, under-cooking—the sacred turkey, yet that’s the number one reasons for a depressing dinner. You can’t trust your eyes with a butterball, so an accurate temperature reading is the only way to guarantee your masterpiece is ready to serve. 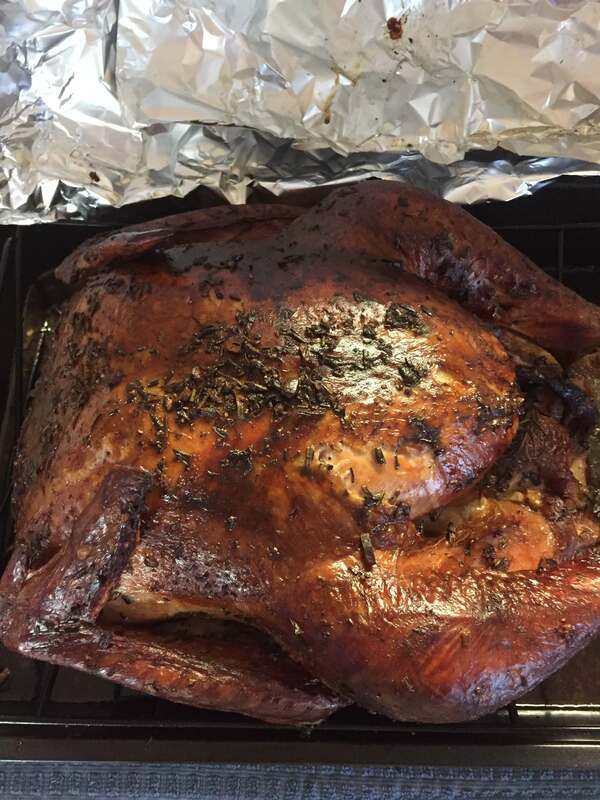 Smoking a turkey is tricky though, but well worth it. But if you are like me, it has to come out just right. And the best way to accomplish this is to have a remote digital food thermometer. Unlike traditional pop-ups or analog thermometers, remote thermometers are wireless and highly accurate. You can leave them in your food and closely monitor the temperature throughout the cooking process, even from another room. Imagine pulling your bird out of the grill or smoker at the perfect moment. Now imagine serving this perfectly browned, juicy smoked bird to your family and friends for Thanksgiving dinner. There are many so-called simple methods and tools for checking the temperature of foods and grills that continuously make their rounds on the internet and in cookbooks. I am going to tell you why these methods are way off, outdated or just plain dangerous. Most smokers and grills come with a built-in dial thermometer, and they are mostly junk. In fact, it is not unusual for them to be off by as much as 100°F. Not to mention, the temperature at the lid is different from the temperature of the cooking grate. 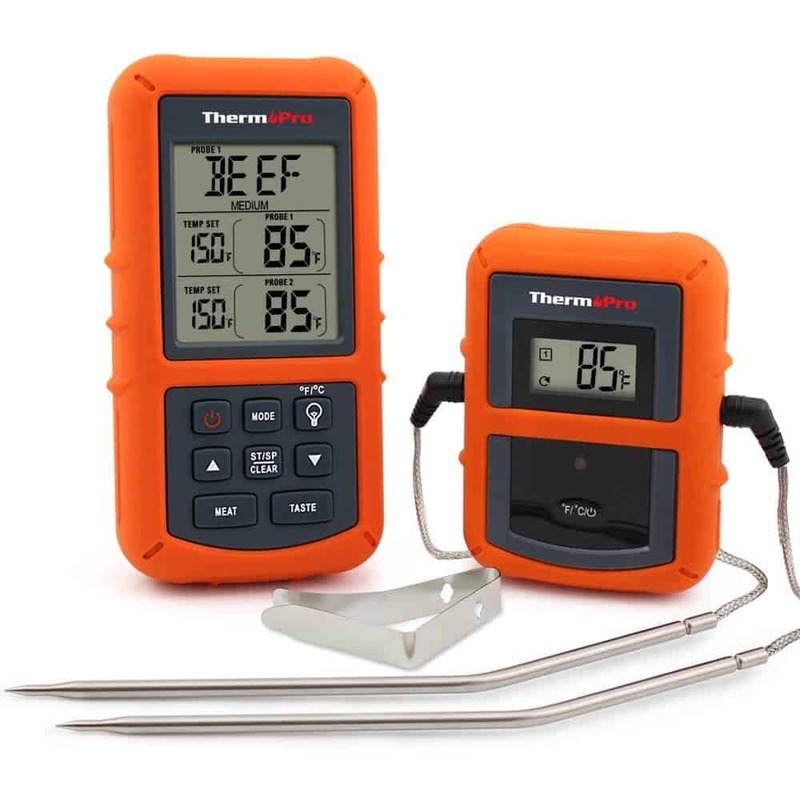 These thermometers just cannot be trusted to monitor the temperature of your grill accurately where the food is actually sitting. A remote digital thermometer can tell you exactly how hot it is at the spot were the Turkey is sitting. About those pop-ups or analog thermometers, I mentioned earlier. Pop-ups are just plain unreliable. They are just as liable to stick when they are supposed to pop, or pop when they are supposed to stick. Also, they only read one section of the turkey and that section is not always the right one. And Perhaps, worst of all, they are usually set to pop up at too high a temperature by the manufacturer to avoid any type of litigation. If your Turkey has one, go throw that pop-up out. Analog thermometers, while slightly more accurate than pop-ups are just plain slow. Do you really want to stand around waiting up to sixty seconds to get a temperature reading that may or may not be accurate? A remote food thermometer will give you an exact and accurate reading of the turkey, and in real-time. Don’t even get me started on this method. If you are not familiar with the Hand Poke Method, you can read the details along with many others like it in this article Meat Temperatures Doneness, How to Tell Without Overcooking. But suffice it to say, I am not a fan and believe that unless you are a professional chef who has poked thousands of steaks over the years, it is complete rubbish! Every cut of meat will feel different, not to mention the different thickness of said meat has an effect too. No two hands feel the same or react the same to pressure, and the reasons go on and on. I told you not to get me started. Again, this just does not work accurately. You cannot get a good read on how hot the temperature of your grill is by holding your hand over a hot grate and counting to three. Everybody has different reactions and tolerances to heat. And besides, do you really want to be the guy who figures out your grill is too hot when your palm starts smoking while counting to three? Everybody’s Gramma’s favorite method on Thanksgiving. Don’t get me wrong, we all love our grandmas, but once again, simply not true anymore. It might have been once upon a time, but modern bird production methods have turned this ancient method on its head. This method is not safe anymore and not recommended. Thanksgiving is not the day you want to have a simple estimate of the temperature of the grill or turkey. You need exact readings at all times for the most awesome results. Your loved ones will expect no less on that day! And you shouldn’t either. If you insist on sticking with any of the above methods, I hope you made a lot of stuffing and other side dishes! Convenience is one of the most awesome reasons for having a wireless remote grilling thermometer. What if it’s raining outside? Or even worse, since Thanksgiving is late November, let’s say it’s snowing outside. Do you really want to be hovering outside in those conditions? Most people would not want that! Here’s where the beauty of a remote wireless thermometer comes in. All you have to do is place the probes in the turkey, and walk away. The wireless thermometer will do all of the heavy lifting for you. Because it’s wireless, you don’t need to be next to the grill the entire time. As a matter of fact, you don’t even need to be outside! Most of the wireless thermometers have a great range. For example, the Maverick ET-733 Wireless Thermometer has a range of 300 feet! Do you need to help out in the kitchen? Are there other needs you must attend to while the turkey is grilling? A wireless thermometer makes this all possible. You can be as active or as passive as you want. The grill will do the job either way. Grilling is more complex than cooking in an oven for many reasons. With an oven, all you do is preheat to the select temperature, and pop-in the dish. An oven should remain at that select temperature for the remainder of cooking time. With a grill, that’s not the case. Temperature fluctuates over time! That being said, how will you know when this happens? Having a wireless remote smoker thermometer is the answer. All you need to do is tell the wireless thermometer what temperature range you want. This is just about as easy as using an oven. Instead of selecting one temperature, however, you are selecting a high temperature and a low temperature. 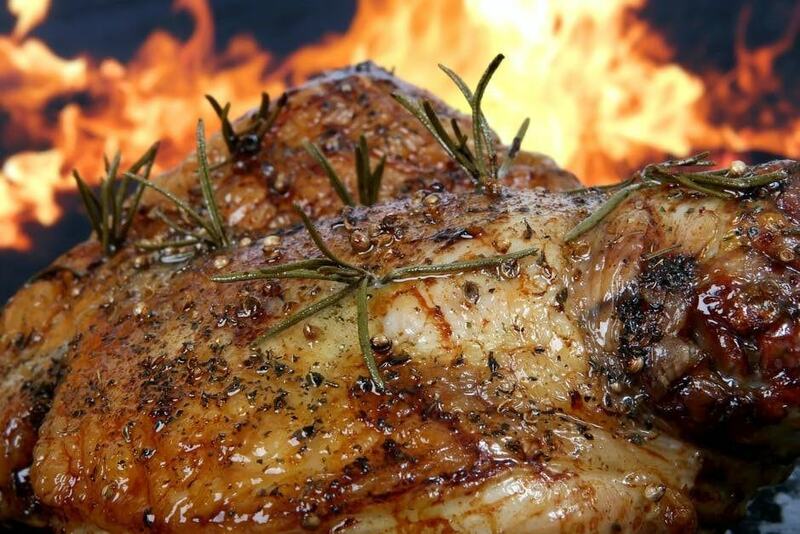 Your goal is to grill the turkey at a temperature that is inside your range and between the two temperature levels. How will you know that the temperature is within your preselected range? Will you need to go outside and check? The answer, happily, is no! The whole reason for a remote and wireless thermometer is that it is truly both remote and wireless. This brings me straight to my next point. The thermometer device will notify you! It’s common sense, isn’t it? How else are you going to know if your turkey is being charred beyond recognition? Likewise, how will you know if the turkey is barely being warmed up? Do you really want to get stuck with the nickname “Cold Turkey” for the next decade of your life? If you’re grilling for Thanksgiving, your reputation is on the line! Receiving wireless notifications is one of the best factors for having a remote thermometer. Because you will likely not be outside, next to your grill, you will need to have some type of alert as to what’s going on inside the grill. If the temperature of the grill or the turkey goes outside of your preselected range, you will be immediately alerted to this. That’s just one more reason why having a remote digital thermometer is so smart. Pairing the features of a temperature range with wireless notifications is a fantastic reason to own a remote thermometer. You won’t have to go outside every couple minutes to check on your turkey. Leave it alone! And set your mind at ease. On a day like Thanksgiving, there are other things to worry about. The grill will take care of itself, but only because you’ll have a remote digital food thermometer. 5.) You Need To Keep Your Grill Or Smoker Closed! 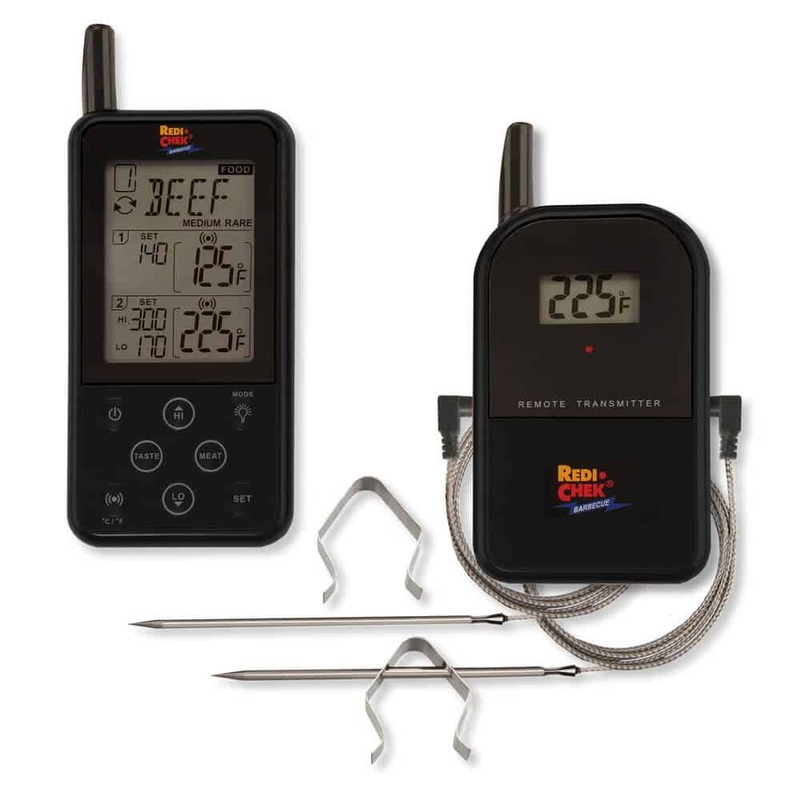 With a remote thermometer, the cables connected to the probe can safely be shut in the grill lid. This means the lid can stay closed. 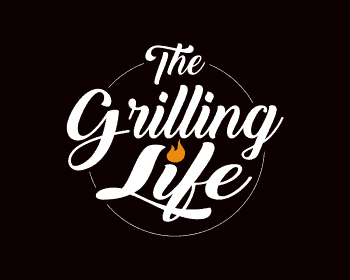 As any griller knows, every time you open the lid, you are losing heat and flavorful smoke, which prolongs the cook and wastes fuel. 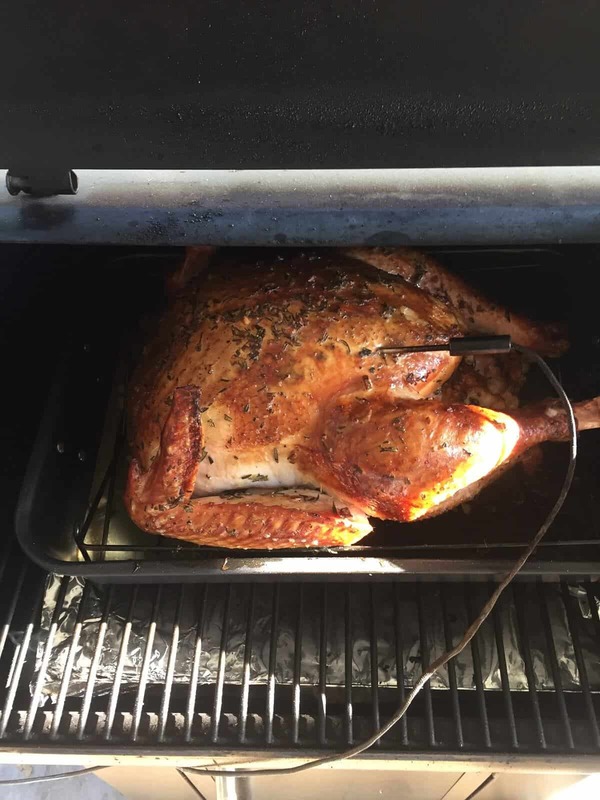 With a remote thermometer, you can track the turkey’s temperature from outside the grill. This is important because you want to keep the inside cooking temperature as steady as possible. In other words, a steady heat just like an oven. An instant read digital thermometer is great for verifying the final temperature and for checking the temp in multiple locations, but save those for the end reading. Being able to keep the lid closed is definitely another of the great benefits of a remote wireless thermometer. Instant read digital thermometers are extremely helpful to have on hand as well and I highly recommend that every griller have one. You can see my Top 10 Instant Read Thermometer Ratings here. How is this for functionality! How about having the ability to know the exact temperature of both the bird and the grill coupled with the convenience and peace of mind knowing that the cook is going as planned without having to check on the bird continuously. Or being able to monitor the bird remotely while you are helping in the kitchen, entertaining quests, or better yet, watching the big game on TV! Add in the fact that your thermometer will remotely alert you if there is a problem and help you speed up cooking times by allowing you to keep the lid closed and the heat inside where it belongs. Wireless thermometers have come a long way and have become incredibly user-friendly. In the age of smartphones, wireless thermometers are no more difficult to use than your phone. They are easily programmable, just by the touch of a button or two. 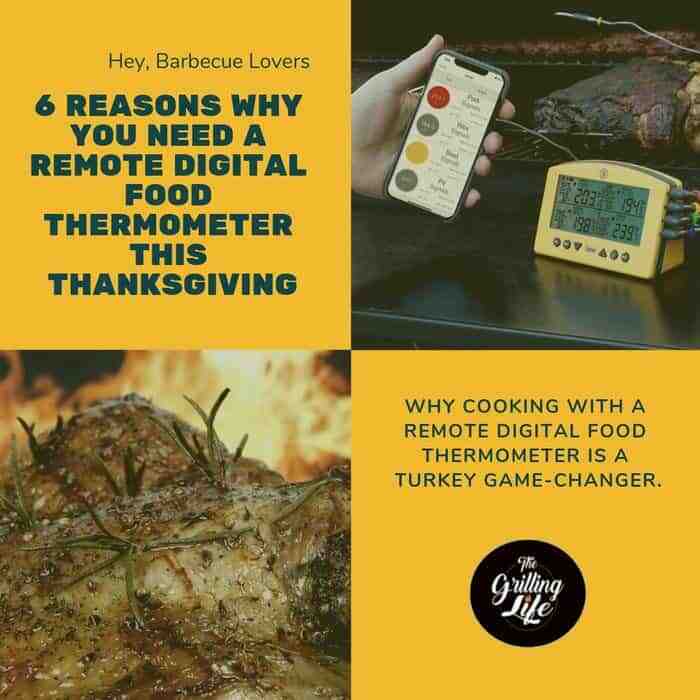 Without a good remote wireless digital thermometer, there is a good possibility that you will be stuck making lame excuses for a poorly cooked bird this Thanksgiving. Smoking a turkey is challenging enough, why not give yourself the best chance to succeed. So for this Thanksgiving give yourself, and those around you, a special treat. This comes in the form of grilling the perfect turkey and is accomplished by owning a remote digital food thermometer. You will taste the difference, and so will your family. They may ask you “what’s your secret?” The answer isn’t only the brand of turkey, or the spices, or the preparation. The answer will also be the remote thermometer! As always, if you or someone you know find this information useful; please consider sharing it with your grilling friends and on social media! Whether you end up using a remote wireless digital thermometer or not this Thanksgiving, I would love to hear all about how your birds came out this Thanksgiving. If you have any useful tips or awesome techniques to share, please do so in the comments below. Appreciating the dedication you put into your blog and in depth information you provide. It’s awesome to come across a blog every once in a while that isn’t the same unwanted rehashed material. Excellent read! I’ve bookmarked your site and I’m adding your RSS feeds to my Google account.